In the past, summer has been a fairly low-key time for the team at VIATEC, but this year we’ve had our heads down, working at lightning speed… and perfecting our computer-glow tan at the same time. The transluscent appearance of VIATEC staff is the result of having a number of projects on the go; the biggest of which has been the NEW viatec.ca which launched one week ago today. Beyond the look and feel, we’ve made serious changes to how it all works. Members will now have more control over everything they want to post: from jobs, to news releases, to events. The site is MUCH faster and we built it with the intention of helping your whole team really connect with what VIATEC offers. The new job board gives users much more control over posts, plus we added an archive so you can more easily pull up old postings to edit rather than starting from scratch or cutting and pasting. The “old” viatec.ca was exactly what our members needed… in 2009. But times change quickly, along with website best practices and VIATEC as a whole. 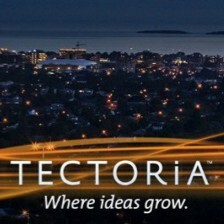 In 2009, VIATEC had a small office at the Vancouver Island Technology Park and a team of 4. After moving to Douglas and Hillside in 2012 and starting the Accelerator Program, VIATEC now has a team of 12, OWNS a newly renovated heritage building and cafe at 777 Fort Street, and rents out office and event space on top of all the services we’ve always offered (plus a few more). The old viatec.ca no longer represented who we are or what our members were in need of. We normally don’t feature ourselves as Tectorian of the Week, but we are just so damn proud of this new site! Check it out and if you have any feedback or suggestions please contact info@viatec.ca. As a child Nathan Wren would break apart old electronics, read everything he could and spend hours doodling. This fascination with understanding how things work has stayed with him his entire life. Nathan was hired as a Mechanical Engineer in 2012 by Daniels Electronics, just weeks before its acquisition by Codan Radio Communications. He’s actually gone from breaking radios in his parents’ garage to designing them for a living in one of the most beautiful settings, Fisherman’s Wharf. Given his childhood fascination you’d think he’d know his path right away, instead he first earned a degree in Psychology before making the switch to Mechanical Engineering. Nathan hasn’t looked back since and has had some impressive moments in his career. “It was a great pleasure and honor to spend several months on a work term at the Herzberg Institute of Astrophysics; the level of talent in that group is truly something else,” commented Nathan. Another moment he will never forget is watching Codan’s new Stratus Repeater product get chucked off a 3-4m rooftop, hit the cement, and still power up and function properly. Codan just launched a brand new suite of transportable products, anchored by the Stratus Repeater, that links conventional radio systems to the current cellular networks. This opens up a whole new range of uses for Codan’s transportable products, and is generating some real excitement in the market according to Nathan. For the past several months, Nathan has also helped breathe new life into the Advanced Manufacturing Roundtable for VIATEC. This month’s event was held at Codan’s headquarters where members heard from Charlie Stuff, President of Codan, and received a site tour through their 30,000 square foot manufacturing facility. We’re not quite sure what to call Ron Proulx, but “Renaissance Man” seems quite fitting. I decided I like Vic better. I like the weather in Vic, because I used to live in Venice Beach, California. I took possession of a condo on 6/1/15; every day is an adventure, with a killer view. I own a music supervision company in film/tv. I manage several TV composers. I co-own a rights clearance company. I had a digital company that got into podcasting; too early i might add lol. I own a patch of trees in the BC Interior; the deer love me. I have written 2 ebooks that I sell online; one has done well, the other not so much. I’m entrepreneurial and/or a bon vivant lol. I’m looking for the next adventure(s); passive or active. I play poker once in a while; I raise with A9 suited. I play piano and sing; good for the soul. I am a big walker; see Vic for why that is good. I had a record deal in another life; I also had purple hair, and now I have none. I believe the arts are important; as is free speech. I live for my iPhone and Apple products; and/or ability to be mobile/everywhere. I was once addicted to Sudoku; I have that under control now. I have made some short films. I was in the middle of producing a feature length documentary for 2 years – shoot/edit/wrangle/produce/chief bottle washer… all until I pulled the plug due to my subject being “unavailable”… long story. My axes = Canon5DMII + FCPX. Due to having a bit more freedom with his business, Arpix Media, (thanks to his amazing employees), Ron decided to move to Victoria, a city he feels is up and coming and more sustainable than Toronto or Vancouver. He’s hoping to be proved right. And, who knows what opportunities will fall into his lap while he’s here. Proulx is also a public speaker with experience as a panelist and moderator. Topics have mostly been about music licensing, but occasionally regarding one of the ebooks he wrote (hownot2suck@businessnbeing), which is a primer for young people entering the workforce. His other ebook is called “How to license your music into movies and television”. Yup, we’re definitely proud of our microbreweries. In fact, there’s now an official map with 25,000 copies placed in tourist traffic areas and at each location!